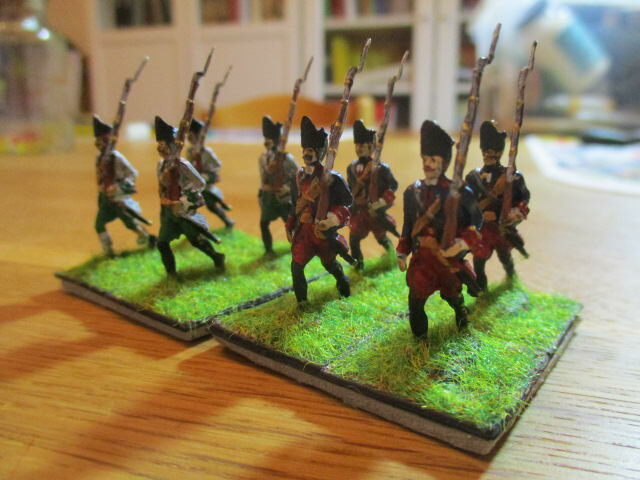 I painted the grenadiers for my small brigade of Piedmont-troops. No Germans and a project a bit crazy. At the left Des Portes and at the right Baden. I have to say that I like both uniforms and find the Piedmont-army colourfull and very nice. I would be greatly interested if you could provide some reference links for uniforms! Thank you in advance! I used the pictures which are looking contemporary or copies following contemporary sources. 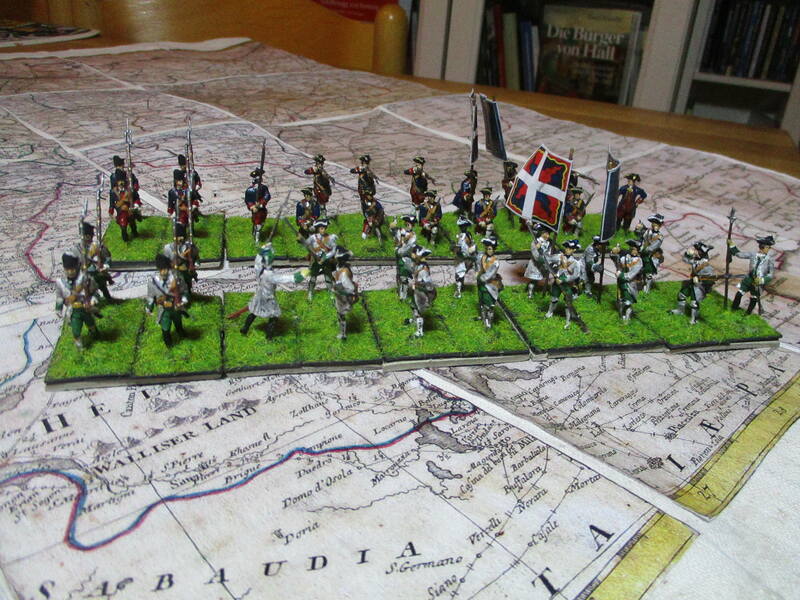 Different from other armies of the time the Grenadiers formed in independent batallions. Oh yes! He has a superb blog! It is good to visit it again, it has "a lot of bread", thank you! I had quoted his Piedmontese de Portes and their distinctive green facings in one previous post here. I think I had found some collective info about Piedmontese uniforms, but I don't remember where. By the way, I mention again that the Piedmontese have very beautiful flags! I'll start reading all his WAS in Italy (1-8) titles! They make an interesting change. I feel it is a pity that in the deal for supporting the drive for Italian unity the French took a chunk out of Piedmont. 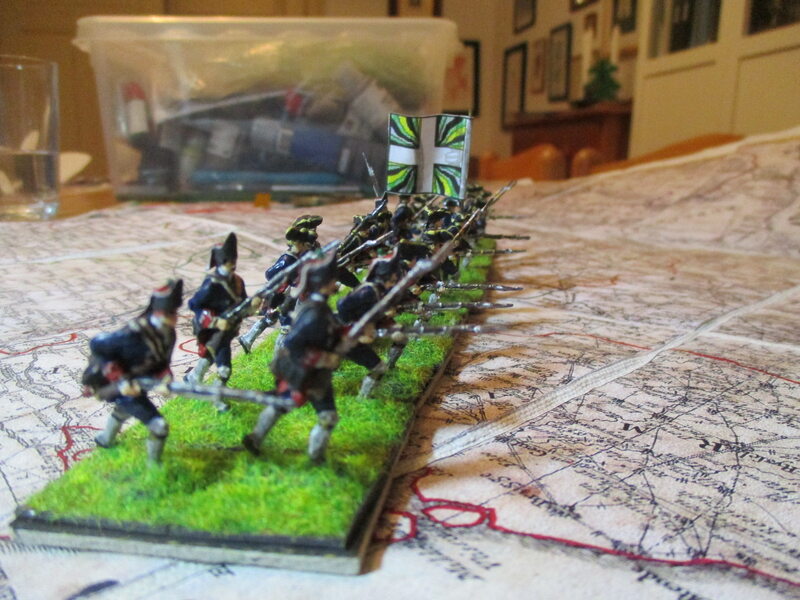 My first unit for Piedmont: Baden-Durlach infantry. I welcome your first Piedmont unit! A good start for your Piedmont army! Cheers! P.S. And they have beautiful flags, too! Here, in another page at the same blog you already mentioned is the description of all his work, which is a unique source for French uniforms of the War of Polish Succession! His uniforms show troops operating under the orders of Marshal Coigny on the Rhein, the Main and the Neckar in 1735. He presents 83 different uniforms (if somebody starts from the page mentioned, looking at newer pages (Entrada más reciente), his work has a humoristic look. Damnitz, thank you again, because you motivate me to search for interesting historical details! I do like the colours. 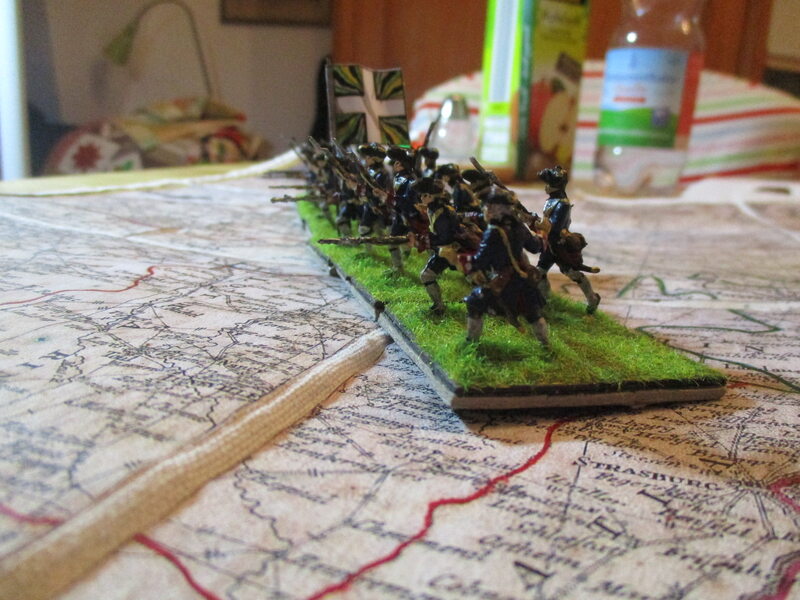 Behind them is my regiment Baden-Durlach. I suppose that these are all of my Piedmont-troops. A nice addition to your collection. Well done! When do you schedule to give them the baptism of fire? I hope they will fight at Guastalla next weekend or next month. Great! Guastalla is one of the battles I'd like to see! 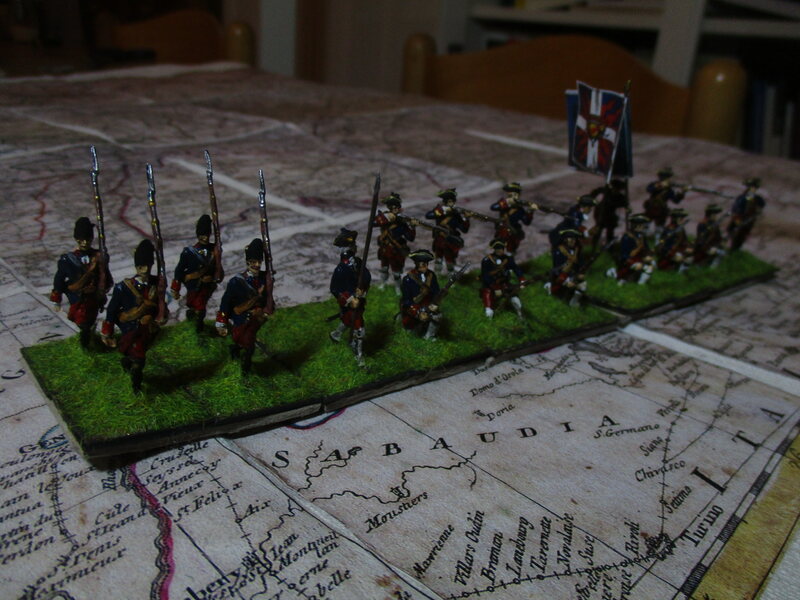 Today I finished to paint the regiment Sturler, Swiss in Dutch pay. The Swiss had the reputation to be of the best troops of the Dutch army. Therefore I decided to let them charge. 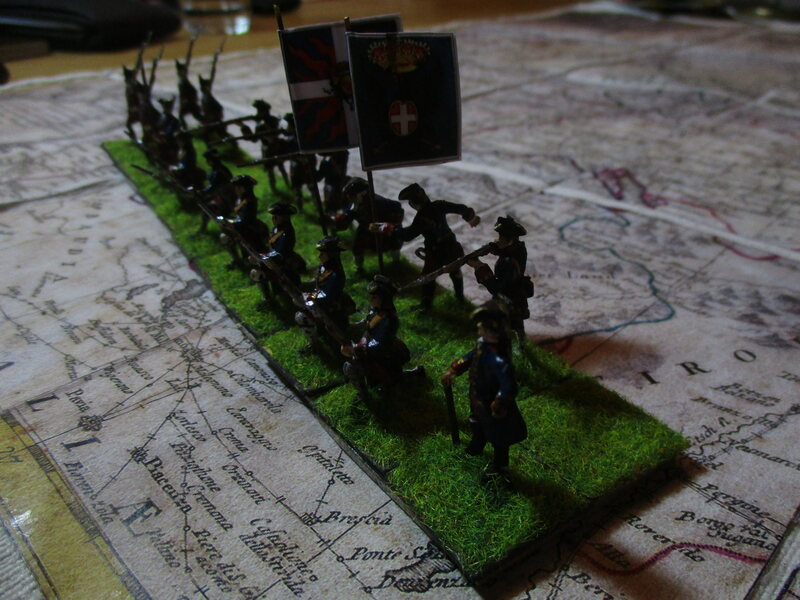 The figures are mostly from the Revell Austrians set as this regiment looked much the same on the famous Morier paintings. For some reason the officer - originally from the Zvezda Russian artillery - has a bottle. 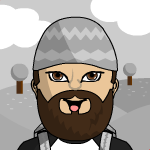 Most figure got a hat made by myself. Not really good looking, but perhaps crushed by heavy rain in the Low Countries. 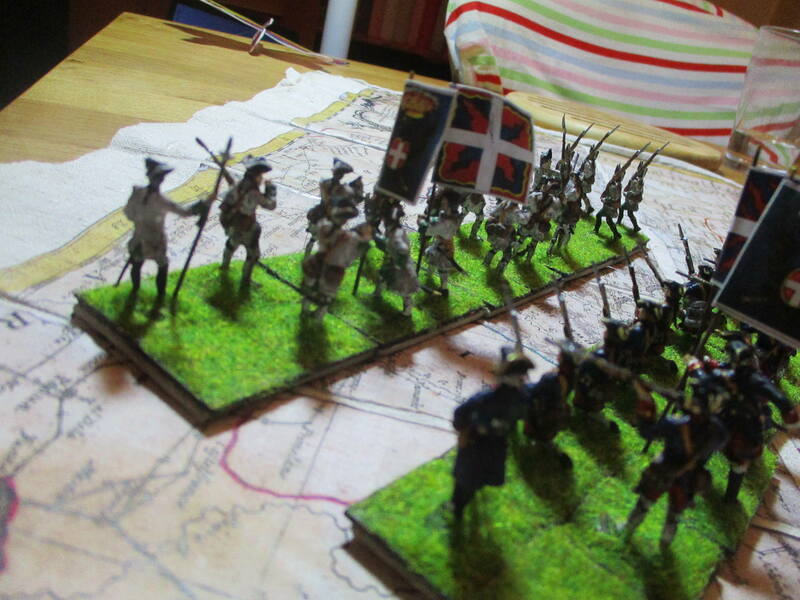 Are you designing some battle in the Low Countries?